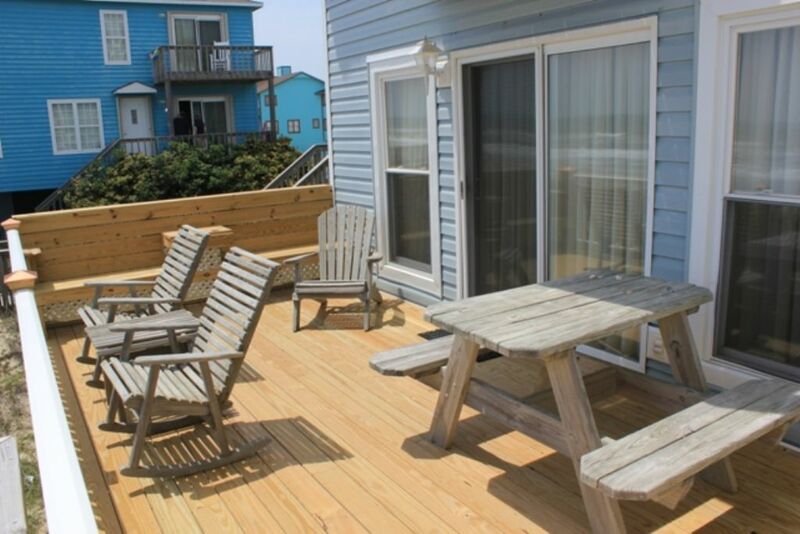 Beautiful ocean views from this Oceanfront duplex! Nicely decorated,3 bedrooms, 2.5 baths. Q*Q*BDS*QSS. Newly painted living areas for 2018 and freshly painted bedrooms for 2019! Updated bathrooms, Central Air/Heat, water softener and purified drinking water system, dishwasher, microwave, washer/dryer, iron and board, ceiling fans, 4 CCTV's, DVD, WIFI. Decks off of living room and master bedroom with furniture, cold outside shower. Rents Saturday to Saturday. Linens provided with weekly rentals. NO PETS! NO SMOKING! "We are pleased to write a positive review of Fins to the Right West. Shorewood Real Estate was very accommodating to our last minute reservation and the check in process was quick and trouble free. The management is professional and very kind, even making sure we were aware of rip current conditions present with our safety in mind. 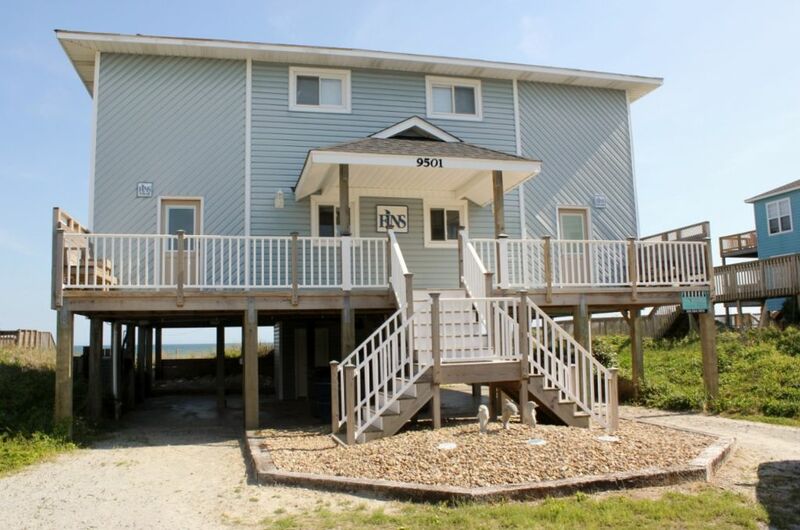 The home itself is very well kept and nicely furnished and is located in an ideal spot away from the heavily traveled beach road but close to the highway 58 causeway for easy access to local restaurants and a short drive to the many shops and eateries in Swansboro. Attention to detail is evident in Shorewood's management of the home. Everything is clean and in great condition and everything worked perfectly from the cottage air conditioning all the way down to the coffeemaker and sharpened knives in the kitchen. Believe me that this is a rarity with many beach homes. 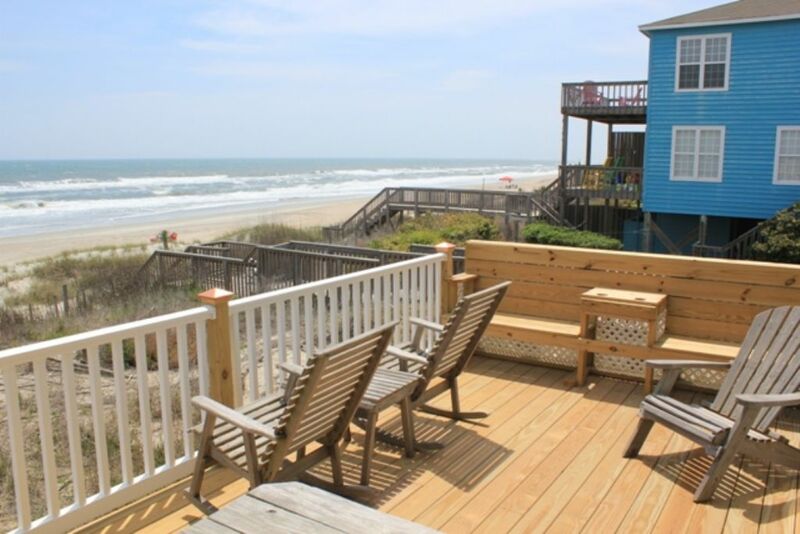 We've been vacationing on the North Carolina coast for decades and Emerald Isle is now our favorite destination, in no small part due to the pleasant experience we had at Fins to the Right. We'll definitely be back." Thank you for your thoughtful review, Paul. We are pleased to know you had a great time at Fins to the Right-W! We certainly understand the importance of having homes filled with everything families need to have fun together! We thank you again for staying with Shorewood & look forward to seeing you again next year! "This is our second year with Shorewood and they have proved again that they take care of their properties. Fins to the right-west was clean on arrival. We noticed that the furniture and bathrooms were updated recently, which was nice to have. The kitchen was well stocked, so the many items we brought due to other lackluster kitchens in the past were not needed. The view of the beach from the house was perfect. The property is located next to a public beach access. We had to "stake" our sight early in the morning to ensure our spot before all the beach goers came. We also appreciated the DVD collection that was provided. The location was great. We had never stayed near the end of Emerald Isle before. With our bikes we were able to go to near by shops, resturants, mini golf, etc. Really enjoyed our week. Would rent again. " "Fins to the right is amazing"
"THE HOME: We was very pleased with how clean, well maintained, and fully stocked Fins to the right -west was with dishes, pots, appliances, board games, Dvds and plenty of linen as well. The WiFi signal was very strong and fast even with 5 devices connected. And i cant forget to mention the Shorewood real estate inc. for making my booking experience as smooth as can be.. great staff to work with. 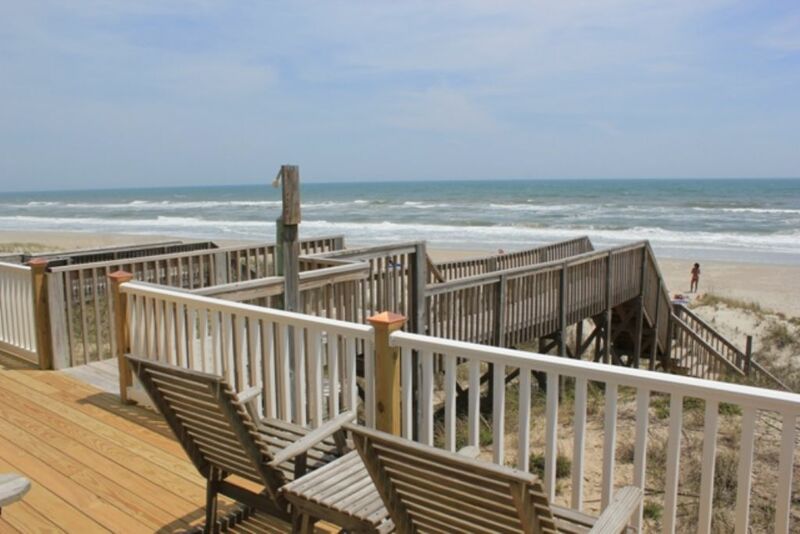 THE VIEW: Words can not explain nor pictures of the type of experience you will have when you first walk thru the doors of fins, to walking out to the lower deck and be instantly silenced by the view of "The crystal coast" right in our back yard steps away from the deck. Now the upper level master bedroom balcony the view was very relaxing with our morning coffee and evening reads. THE BEACH 1st week of April : avg.72 degrees and up. Water was warmer then expected and gradually got warmer during our stay. OVERALL We are giving Fins to the right-west an extra *star for having a Steelers Dvd in collection ;-) go Steelers!!! We enjoyed our stay. Thank you and we are planning our summer vacation to return to Fins. T. Benjamin "
"We love that Grandpa can surf fish and we can stay on the deck or house and assist him if needed--the rest of us are not fishermen. 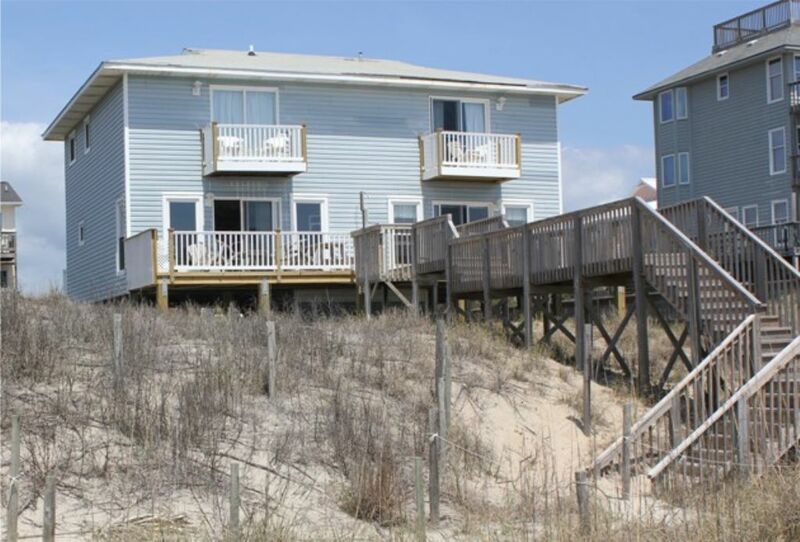 We love the area of Emerald Isle, the beach size etc. and easy access to the shopping center. Some of our party like to walk to the Point during our stay. The house is well stocked and we like the linen service so we don't have to pack those, too. Shorewood office personnel are great! A big thanks to our "savior" when we were locked out. A restful beautiful week was enjoyed by all, after several cool days at the beginnjng of the week. Grandpa didn't catch any fish for the first year. Disappointing but Islanders said the water was murky and the fish don't like that--from the previous rains." "Fins was an absolute perfect fit for our family. The space was just enough for us. The kitchen was well-equipped. The furnishings were nice and new. We enjoyed viewing some of the owners' DVD. 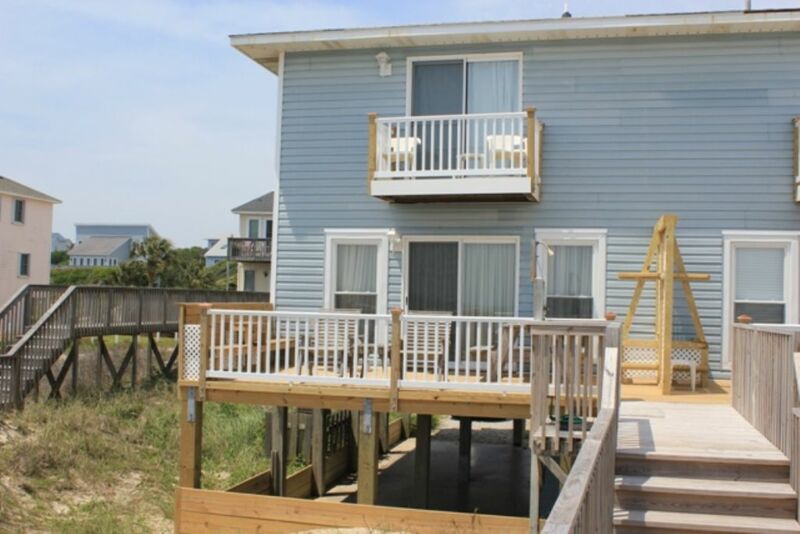 We would very much like to rent it again the next time we are back in Emerald Isle." "A very relaxing vacation. The longest we have ever had, in a good way. It seemed as if time moved so slowly. We called it "Emerald Isle time!" It was awesome being right on the Ocean and will certainly plan on that from here on out." "The house was adorable, clean and bright. We loved being able to see the ocean everyday. We came down to see my son who is stationed at Camp Lejeune and it was very relaxing for him as he got to spend a couple of days with us. We plan on renting Fins to the Right again!" Great Property for a small family. "We loved Fins to the Right. Great beach access and wonderful views. The kitchen was well stocked and had everything we needed. The property is located in a quiet area of the beach with a small playground within walking distance. The master bedroom was very comfortable and our daughter loved the room with the bunk beds. The bedroom with the double is a little small and dark, but worked well for our small family."